Tonight was about playing around with the make-up of one of my current Two-Team Takedown Teams. I have really been enjoying this one, and wanted to play around with some tweaks. Since a big part of this Team was made up with X-men, I decided to focus the changes on that Affiliation. 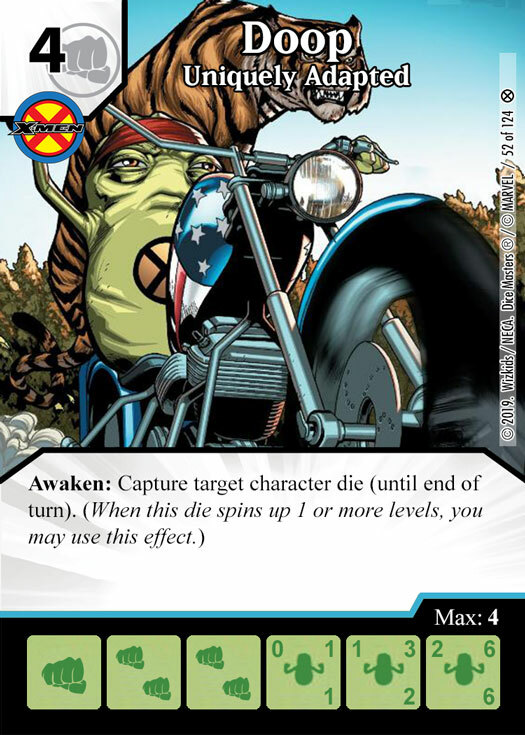 Doop is the central part of this build (Note: This image is not a real card… yet. Get on it Wizkids!). His Awaken ability allows me to take things off the board for a turn. This can clear the way for my side to march through. Currently, the easiest way to make use of the Awaken ability is to pair it with Energy Field. For a price of a mask, I can spin the same character up and down to trigger the Awaken effect. As long as Doop is not on level 1, this will work well. To mitigate the level 1 issues, I put Thunderbird on the Team. He will allow any of the X-men characters that I field to immediately spin up, putting them on the crucial level 2 at a minimum. I went full on with the Awaken theme for the rest of this build. Since the win-con will pretty much be combat damage, I put Jubilee to help clear the smaller characters out of the way. Her top level also has a decent body to it, which will contribute to the win-con. Storm was there for removal as well, but she is so hit and miss for me overall that I did not see myself buying her unless I saw a Green Devil Mask. The last of my X-men was Sunfire. In a pinch, his ability would buff my attackers giving me that extra push to get my damage through. The rest of the Team were all accessory pieces. Billy Club was a source of masks to help with powering Energy Field. Xavier’s School was an interesting addition that I wanted to try out on a pure X-men Team. Best case scenario, I get free characters out with it. Worst case scenario, I churn through my bag. Heimdall was an experimental addition to the Team based on my TTTD match with Reg. I found he paired well with Xavier’s School when I drew two Sidekicks with the ability. Resurrection was the final addition for another Ramp option. Let’s see how the X-men worked this evening. Bye! I still own this guy. A nice little mix of some old school tools (PXG, Morphing Jar, plus the new Clayface Global). The win-con was basically overcrushing Sidekicks powered by Larfleeze, and Mxy for doubling Larfleeze. Doop was an early purchase for me as it was really the only way to deal with Larfleeze once he showed. Unfortunately, the first time through he used Mxy to make Doop a Sidekick which was not really helpful for me. Onto the second Doop. He can’t shut both of them off. However, he can turn one of his guys into Doop and capture all of my stuff and swing through for lethal. Doop (copied… but it still counts) FTW! Jimmy and a Striking Superman. Same plan in this game. Get too Doop as quick as I can. It took a little longer, but eventually he came out. Once he was in the Field, I could take the Superman with Strike off the board, negating the bonus. I made good use of Thunderbird in this game and bought all of my Jubilees. On the final turn, I used Xavier’s School to field a Jubilee from my Bag and spin her up to level 2 thanks for Thunderbird. I had lots of stats on hand and managed to have enough masks to let Doop take the remaining characters off of the Field. Doop is just incredible. With the new Energy Field Global now at our disposal, Doop is a solid form of removal and has great stats to back him up. I always enjoyed the little green guy, but now I might be in love. If you have not tried this basic combo, you really need to. Let’s walk through the rest of the pieces now. Jubilee is excellent removal of the small guys. She can clear out an army of Sidekicks with a single Mask. Storm was not purchased all night. Like I said earlier, I really only kept her around in case of a GDM. Billy Club is too essential of a piece to remove from this Team. Sometimes, you need that mask and fail to roll one. This is a great back-up plan. Thunderbird was an excellent way to mitigate the level 1 fear for the Awaken characters. Sure, the Giganta Global was a little better situationally, but Thunderbird worked just as good as a body in the Field. Sunfire was not needed all night to be honest. However, I have some plans for him later. Xavier’s School was a great add to this Team. Multiple times, it got me a character when I needed one. When it did fail to pull X-men, it put Sidekicks in the Used Pile for HXG. Worst case scenario, I had masks to use with Energy Field. Awaken has become a solid ability thanks to Energy Field. There are lots of tricks you can use with this Global. If you do not go with Doop specifically (but why wouldn’t you?) I highly encourage you to try one of the characters with this ability. Have you played around with Awaken? Is there a better X-men character than Doop? Let us know in the comments below. Posted in Constructed, Dice Masters, Team BuildingTagged Billy Club, Doop, Energy Field, Heimdall, Jubilee, Resurrection, Storm, Sunfire, Thunderbird, Xavier's Schoolcomment5 Comments on Doop, There It Is! Awaken with energy field global (which is case you are unaware is a reprint of mutation global/polymorph global) is pretty solid, I too really like this doop as with the right team set up he’s like a juiced up rare scarecrow. Unlike polymorph or mutation however, your opponent can’t buy the action and swap out your good characters in the field so it does have that benefit. But yeah justice and the mystics packs has done a lot to make dice spinning teams more viable. I’m hoping awaken will return in X-men Forever as well. Actually, take a closer look at the Global on Energy Field. It is different than Polymorph/Mutation. Instead of requiring two different characters to spin up and down, you can do it do the same character. I honestly thought it was the same at first until someone pointed out the wording difference. Energy Field is far superior for an Awaken based Team. Now you have me dreaming of an Awaken Scarecrow. Please Wizkids?!? Did you look at adding Zatanna – Being of Magic? While Zatanna is active, when you field a character die, spin it up 1 level. She would be a great addition to a Team like this. However, I tried to stick to the X-men theme here.